There are some rescues that weigh heavily on us and cause us to lose sleep at night. We worry for their well-being and cannot rest until they are safe with us. Faith was one of these rescues and she is extremely special to us and anyone who meets her! She was so skinny and frail when we got her that they couldn’t even spay her at the time. With our foster’s TLC she gained 30lbs and became when more beautiful! We did not know she was deaf until our Foster started noticing a few things, like not listening! Her favorite pastime was counter surfing in their home, along with being there personal comedian. She has a spunkiness about her that brings a smile to your face immediately! When we first got Faith, she could not stand the sight of other animals or even being near them. Over time, she learned how to interact and play with another dog in the foster home. This was a huge accomplishment! Keep in mind, Faith came from a horrible upbringing and possibly a drug house, so all she knew was to be defensive. Over the past year she has made unbelievable gains with her ability to interact and play with other dogs, even though the play must be on her terms. Deaf dogs are often extra sensitive or shy and can be more of a challenge to train. She is an anomaly because this girl is as confident as they come when it comes to Dogos. However, she has been challenging to train, so we got her set up with a phenomenal trainer, James Oliver with Dog University in Vienna, VA. He’s done wonders with Faith and she is going to be ready for a new family for the holidays! 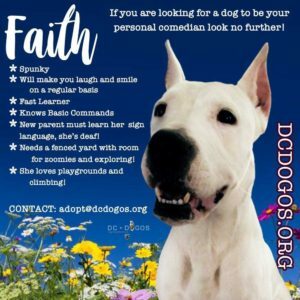 The perfect family for our Faith would be folks who want a very loving and fun dog but willing to continue her training. Ideally a home near Vienna, VA would be ideal but if you’re willing to travel and meet Faith and James we would consider moving her further. Faith is a great dog and still a work in progress. She is going to be a phenomenal companion for the right adopter! We think a home with her as the only dog would be ideal considering she likes to be in control of play and this can be challenging. We also know that her new home cannot have cats since she thinks those are things she should chase down. 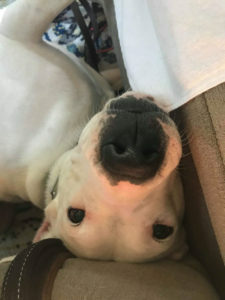 If you’re are interested in learning more about this wonderful Dogo please fill out her adoption application or reach out to us by email or phone. Thanks for your reading and please share our beautiful Faith!